Led by the tenacity of CP3 (Chris Paul), The Houston Rockets take a commanding lead of the best of seven series with a win at Toyota Center. The night had sentimental value and added meaning with the entire senior class of Sante Fe High School in attendance. The Rockets gave the students a much needed reprieve from the horrific shooting that had recently taken place at their high school located just south of Houston near Galveston. The series now shifts back to Oakland for game 6 in which the Rockets could close out the series or with a loss bring the series back to Houston one last time for a decisive game 7. Chris Paul left the game in it's closing moments with what appeared to be a hamstring sprain which could hinder his appearance in game 6 or 7. 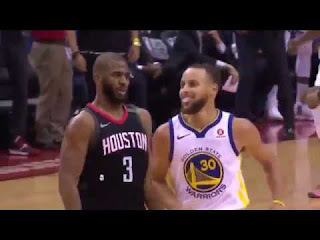 It is the Rockets hope that he will be able to play but should he not be able to go, Eric Gordon is more than capable of taking up the slack as he did earlier in the year when Chris was out.